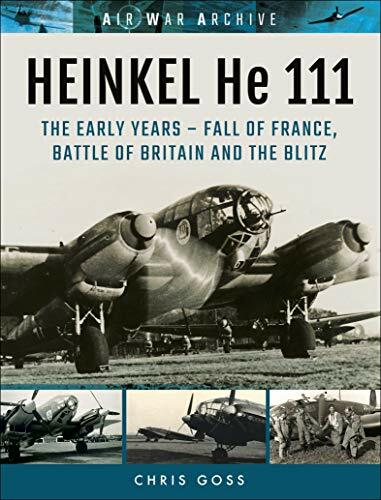 [PDF] HEINKEL He 111: The Early Years - Fall of France, Battle of Britain and the Blitz (Air War Archive) | Free eBooks Download - EBOOKEE! Description: Considered to be the best known German bomber of the Second Wold War, the Heinkel He 111 served in every military front in the European theater, having first being deployed in the Spanish Civil War in 1936. It then saw extensive service in the invasion of Poland, the Norweigan campaign and the invasion of the Low Countries and France in 1940. When the Luftwaffe was tasked with destroying Britainâ€™s ability to resist invasion in 1940, the He 111 formed almost half of the Gruppen employed by Luftflotte 2 and Luftflotte 3. When the Luftwaffe switched to attacking cities and industrial sites the Heinkel 111 was widely employed, with raids against targets such as London, Coventry, Bristol, Birmingham and Liverpool. In this selection of unrivaled images collected over many years, the operations of this famous aircraft in the early years of the war â€“ particularly the invasion of Poland, the Blitzkrieg in the West, the Battle of Britain and the very early stages of the Blitz â€“ are portrayed and brought to life. No comments for "[PDF] HEINKEL He 111: The Early Years - Fall of France, Battle of Britain and the Blitz (Air War Archive)".